Although clams can be bought in a can, already cooked and shelled, there's nothing like using fresh ingredients. Soft shell clams, or steamers, are the best clams to use for a chowder. Even though there's a process to preparing the fresh clams that can be skipped by using canned or frozen, the steps are simple and the extra flavor in your clam chowder will make it worth the trouble. Pick through the clams, and discard any that are broken, fully opened or partially opened. Fresh, live clams will close in open air. Fill both pots with cold water in the sink. Pour the clams into one of the pots. Stir the clams around a bit, then leave to soak for about 5 minutes. Pour the cloudy water into the sink. Transfer the clams to the other pot with cold water and repeat the process. Keep transferring the clams to a new pot of fresh water. When the water stays clear, the clams will be properly cleaned and you can stop soaking them. Add 2 cups of water to one of the pots, and bring to a boil. Add the clams and cover. Stir occasionally with a wooden spoon while they steam. When the clams open, about 5 minutes into steaming, they're cooked. Remove the clams from the pot and shell them, opening the shell and prying the flesh from the shell with a knife. Also use a knife to remove the siphon and coating on the clam flesh. Place in a bowl and refrigerate until you're ready to add the clams to the chowder. 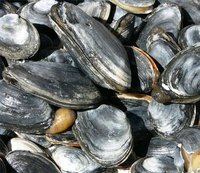 This article provides instructions for carving out strips from fresh clams as well as a recipe for frying clam strips.